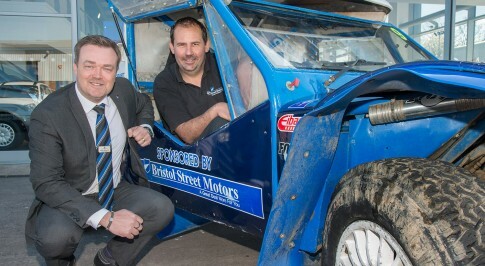 Bristol Street Motors Ford in Worcester has continued its backing of a talented workshop technician and motorsport enthusiast, as he sets his sights on a national championship. Paul Harris will contest the Britpart MSA British Cross Country Championship (BCCC)  the highest level of the sport  again after competing in the competition for the first time last season, where he finished 10th overall and second in his class, following back-to-back victories in the trophy class in 2012 and 2013. The dealership, which is located on Cosgrove Close, has pledged £1,800 towards the cost of Paul's entry fee into the BCCC  the third consecutive year it has done so. Paul said: "I am very grateful to Bristol Street Motors for its kind support, which has allowed me to continue to pursue my passion for racing and motor sport, as well as all my colleagues and customers at the dealership who are very encouraging. It was great to compete in the BCCC last year and I am excited for the season ahead. "Last year I encountered some technical problems, so I could have possibly been placed higher, but overall I am pleased with my first full season in the top division. I am now looking to push on and solidify my position in the top 10 and compete for the title." Paul will once again race his BMW V8 powered GSR Maxilight, a car which he has transformed from a bare frame to a championship winning off-road car, including replacing its engine and gearbox in the offseason. James Turner, General Manager at Bristol Street Motors Ford in Worcester, said: "Everyone here at the dealership is excited for Paul and the season ahead, which will hopefully be another successful year for him. Paul is a hardworking member of the team, who does so much for his customers, so we were more than happy to support him in this way again."